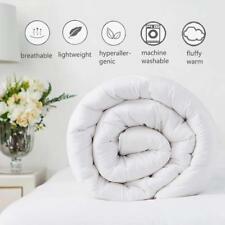 Comfortnights, Waterproof and Wipe clean Duvet Protector Single bed. Designed to be used under normal bedding, you can keep the duvet protector clean by wiping over it with warm water and detergent for easy maintenance. Waterproof Duvet Protector. Wipe clean with warm water and detergent. OVER 50,000 SOLD & 200,000+ FEEDBACK & FREE DELIVERY!! 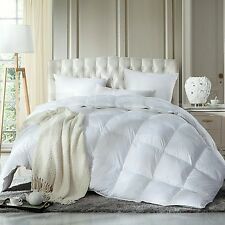 Goose Feather & Down Duvet 4.5 Tog Light & Warm Quilt ~ ALL BED SIZES FREE P&P ! Beautiful trellis design in a blue/aquamarine/turquoise color that would work in any room to add modern flair! The main blue color is offset with the trellis design in white. 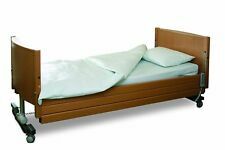 The sheet set is white with the blue/aquamarine/turquoise trellis design on them. 5pc Twin Size Comforter Set Includes: 1 Comforter (66" x 86"), 1 Pillow Sham (20" x 26"), 1 Flat Sheet (66" x 96"), 1 Fitted Sheet (39" x 75") and 1 Pillow Case (20" x 30"). 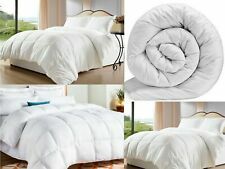 1 Full/Queen Comforter 90 x 90. 2 Standard Shams 20 x 26. Harbor House. Machine Washable. 100% cotton. REGAL COMFORTTHE WOODSTHE COMFORTER SIZE IS 104" X 94"COMFORTER ONLYKING SIZEMACHINE WASHABLEDRYER SAFEMICROFIBER You are getting one Comfort by itself. Machine washable gentle cycle with cold water. Tumble dry low or line dry. Bed Skirt 78" x 80", 2 Decorative Pillows- 1 with Embroidery and 1 with Gold Detail. All hardware and parts must be included. Comforter is a solid BLUE color on the back and camo BLUE on the front side. COMFORTER ONLY. 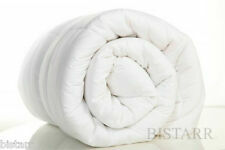 Little ones will love this pleated comforter, as it is soft and inviting. The comforter is also easy to clean, so you have one less thing to worry about. Includes: Comforter. Style: Toddler bedding sets. Harbor House™ Coastline King Sheet Set. Queen sheet set includes King sheet set includes California king sheet set includes Twin sheet set includes Full sheet set includes One 66" W x 96" L flat sheet. BIOHAZARD GREEN CAMO COMFORTER ONLY. COMFORTER ONLY.